Ekobit has just released a free VSTS utility: Pending changes browser. This custom Visual Studio Tool window lets you query pending changes in the TFS version control database. In contrast to the ordinary pending changes window the Pending changes browser in addition to the files you have checked out, can show the files other team members have checked out as well. This can be very usefull if you wan't to check whether everything is checked in before you start the build and you don't want to use the command line tool. Additionally, pending changes can be queried in various ways. If you have ever needed to find out who has checked out files from your project on the Visual Studio Team System source control then the only solution was to browse through all the folders of your project in the Visual Studio Source Control window. Because this is such a common issue, Ekobit has developed a small Add-In for Visual Studio 2005 which can help you solve this problem. List pending changes browser is a small Add-In (technically it is a VSIP package) for the Visual Studio 2005 Team Edition for Software Developers which enables you to view who has checked out what in your project. 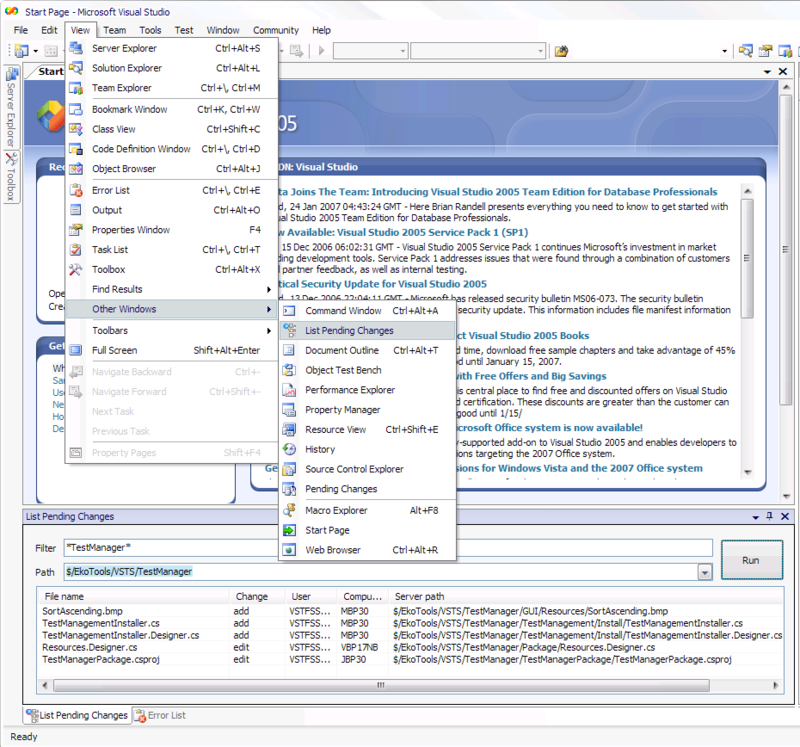 It adds a new tool window (List Pending Changes) to the Visual Studio 2005 collection of tool windows. Using the List Pending Changes browser is relatively simple. You can access the browser from the View menu -> Other Windows -> List Pending Changes menu item. In order to list checked out files you must fill out the Path input field. Path input field represents the root of your search and it must be in Visual Studio Team System source control path format (example: $/MyProject). Beside entering the path manualy you may use the Path field as a combo box and select the path from the given list of paths. The list of paths that will be displayed in the Path combo box drop-down depends on the Filter input field. If the filter input field is empty then you will see all the possible paths starting from the source control root. If the filter input field is not empty then you will see all paths where the filter matches the path. Wildcards (*) are also permited and by using them you can filter by parts of the path.